The spiny ash sawfly (Eupareophora parca) is a small wasp that was first noticed in Edmonton in 2003. It occurs throughout the U.S. and is known in Canada from Saskatchewan to the Maritimes. The larvae look like greenish or yellowish caterpillars with short fleshy spines and dark-coloured heads. 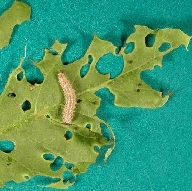 Young larvae chew holes in the leaves; older larvae will consume whole leaflets. It does most damage to young ash trees in plantations and to young and old ash trees in ornamental plantings. Presently this insect does not appear to be causing serious damage. Pest control staff may control this insect on City trees on an individual complaint basis. Spiny ash sawfly and feeding damage.